GamiPress includes a fantastic drop down that let’s you search on options available. 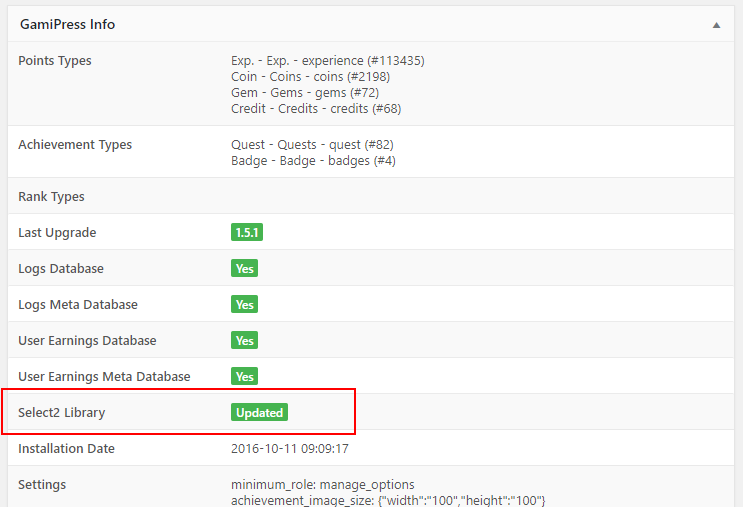 Probably the first time you see it is while setting up some requirements or when you are using our shortcodes editor or setting up one of our widgets. This useful drop down comes from the Select2 library and a huge number of themes and plugins makes use of it too (one of them WooCommerce). If you are experiencing issues with those drop downs, it means that any of the plugins or your current theme installed is loading an outdated version or this library. To find which is causing the issue, perform a theme and plugins conflict test and contact to the plugin or theme author. In addition, through GamiPress -> Tools -> System Tools you can find a the “GamiPress Info” box that notifies you that is the library is outdated or not.